Does Workers’ Compensation Cover Car Accidents on Business Trips? I recently had a client who said to me, “I travel a lot for business. If I’m hurt while on a trip, am I covered by workers’ compensation?” This is an excellent question. As a general rule, workers’ compensation is designed to protect you while you are at work and doing your job. So what happens when your job takes you out of the office or away from your work site? The good news is, yes! You are covered while on a business trip. The reason is that the entire purpose of your trip is work related. Therefore, in most circumstances, any injury that occurs is going to be while you are performing your job. This includes automobile accidents. Even if you were at fault, you are still eligible for workers’ compensation. This is because workers’ comp is a no-fault system. Its purpose is to cover lost time and wages due to a work injury; fault is not taken into account when determining workers’ comp. 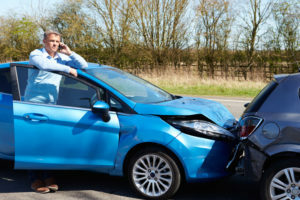 Therefore, workers’ comp does not treat an automobile accident any differently than it would treat a fall in the workplace. Workman’s comp will even cover you when you’re traveling out of state or out of the country, provided you are traveling for business. And this does not just apply to injury — if you become ill while in a foreign country, you could qualify for benefits. If you’ve been injured while on a business trip, don’t hesitate to call an experienced attorney at Oxner + Permar for a free consultation. We’re dedicated to making wrongs right, and ensuring that you get the benefits you deserve.